I love lamb. I especially love Utah Lamb. Some people complain that lamb has a gamey taste and that they don’t like the flavor. To these people I say, you have not eaten a good piece of lamb! People also complain the price of lamb is too expensive. While legs of lamb, rib chops and racks of lamb can be expensive, there are other cheaper cuts that are just as delicious as the more expensive cuts. It is becoming more important to people to know where their food comes from. In Utah, I know where the lamb comes from. It comes from the same place I hunt deer and elk. From the pristine mountain forests and meadows of Northern and Central Utah. 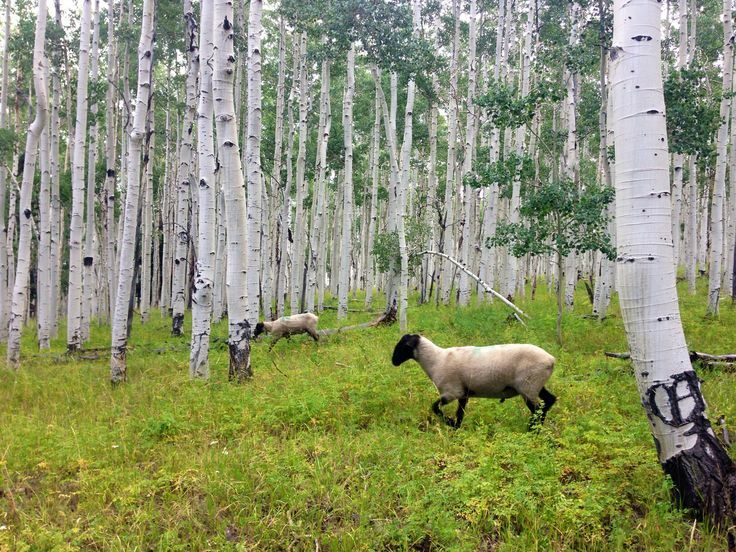 In the spring and summer, Utah sheep are raised on the same grasses and forbs that deer and elk eat and they drink from the same crystal cold springs and waterholes. In the fall, the animals are herded out of the mountains and the lambs are then slaughtered. In the past, I have bought whole lambs directly from the rancher. This is the best way to enjoy Utah lamb, however if you do not have access to a Utah sheep rancher then the next best thing to do is to look for Utah lamb in your grocery store. You can also find Utah lamb Purveyors on the internet, Below are two excellent Utah lamb produces and their website addresses. Contact them and see if they can provide you with fresh Utah lamb. 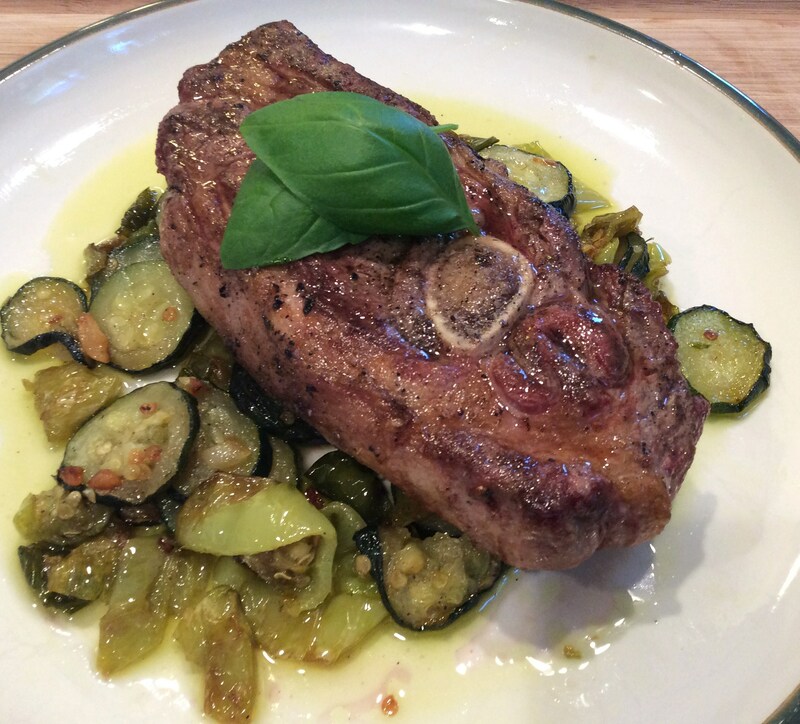 The following is one of my favorite ways to cook a lamb shoulder chop. This recipe brings out the flavor of the lamb and combines it with the fresh flavors of the herbs and vegetables from my back yard garden. 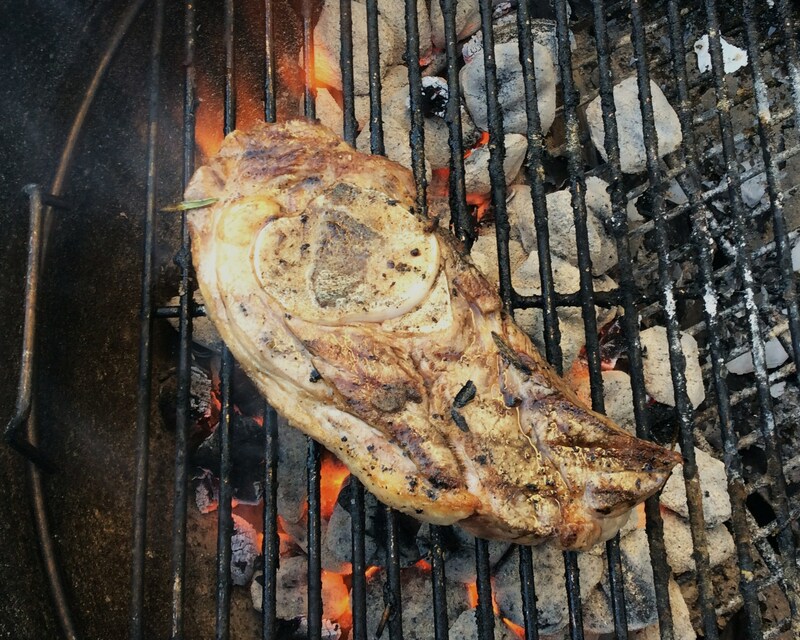 The recipe calls for the lamb to be grilled over oak wood and charcoal. If you can’t cook with wood over an open fire, this recipe is also good when you broil the chop in your oven. 6 sprigs of fresh Rosemary. Bring the lamb chops to room temperature. Rub the chops liberally with the olive oil. Sprinkle with the garlic powder. Take 3 sprigs of fresh rosemary and strip the leaves from the stem. Sprinkle leaves evenly over the chops and press into the lamb chops. Remove the lamb chops from the refrigerator and bring to room temperature. While the chops are coming to room temperature, fill a charcoal chimney with charcoal briquettes and lite. Once the charcoal briquettes on the top are white, pour the coals into your grill and pile to one side. Place a small piece of oak on the coals. Allow the wood to burn down a few minutes before you grill the lamb. Let the grill rack heat up. Once the grill rack is very hot, place the lamb chop on the grill and sear both sides. About 2 minutes per side. Move the chop to the side of the grill that has no coals. 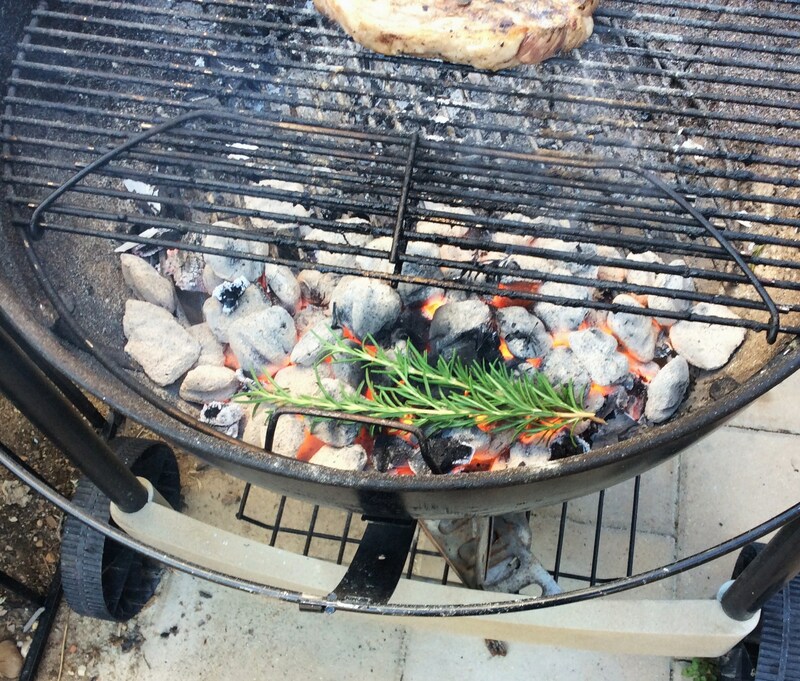 Now, lift the charcoal grill and place 3 sprigs of fresh rosemary on the hot coals. Place the chops on the rack directly over the rosemary sprigs on the coals and cover the grill. Allow, the rosemary to smoke and infuse the meat. This should take about 3 minutes. Remove the lid and turn the chops several times over a 5 minute time span. I prefer my lamb medium rare. If you want it cooked more leave it on the grill for longer. Remember that the thickness of the chop will effect the total time needed to cook your chop. 4 fresh green zucchinis from the garden, sliced into 1/4 inch rings. 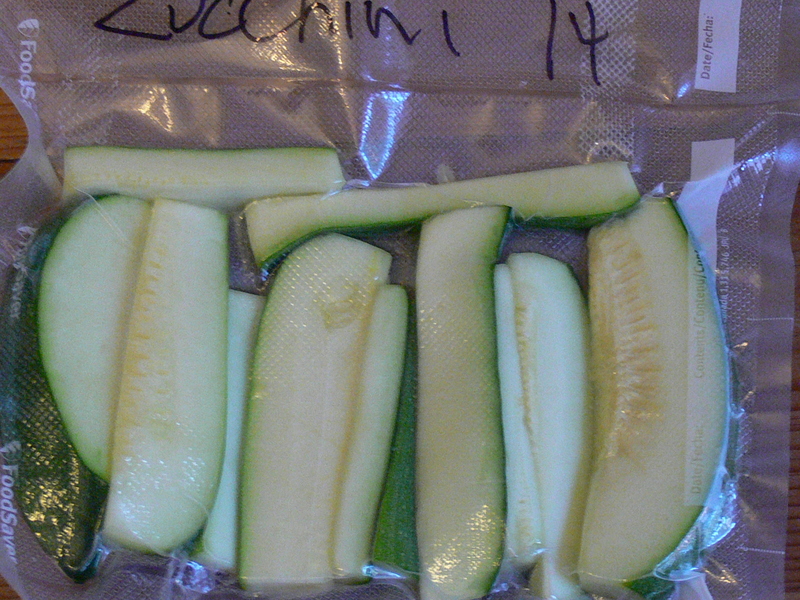 For best flavor, the zucchinis should be no larger then 12 inches long. 2 Japanese eggplant, sliced in rings. 4 sweet Hungarian wax peppers, sliced. 2 green bell peppers, sliced. 6 fresh basil leaves, chopped. 1 tablespoon fresh oregano leaves. 1/2 tablespoon of fresh thyme leaves, no stems. 1/2 cup of fresh chives, chopped. Heat the oil in a frying pan until hot. Add cut vegetables and garlic to the pan. Stir vegetables and cook until they begin to soften. Cook until the vegetables are tender and soft. Place the vegetables on a plate and place the lamb shoulder chop on the center of the vegetables. Garnish the lamb chop with a few fresh basil leaves and serve immediately with a nice red wine.. This article and picture are being shared from The Eden Prescription on Facebook. Purslane Extract Kills 83% of Liver Cancer Cells in Vitro: An extract of purslane seeds was shown in this new study to kill up to 83% of human liver cancer cells in vitro within 24 hours. Purslane extracts have already been shown to be toxic to breast cancer, lung cancer, cervical cancer, and sarcoma in other studies. What makes this leafy green so powerful? Besides containing the anticancer flavonoids kaempferol, apigenin, luteolin, and quercetin, this super vegetable also delivers 17 vitamins and minerals, omega-3 fatty acids, powerful antioxidants, and four flavonoids unique to purslane (portulacanones). And purslane’s health benefits don’t stop there. It’s already been shown in clinical trials to help adults with type 2 diabetes by significantly lowering their blood sugar, cholesterol, triglycerides—and even helped them lose weight! (after just five weeks of eating purslane seeds.) Purslane also has demonstrated powerful anti-inflammatory, anti-bacterial, anti-fungal and anti-viral properties, and has been shown to boost immunity by increasing the number of white blood cells (in mice). All of this for just 13 calories per 80 gram serving! And alkaline diet fans take note, this low-calorie leafy green delivers four times the alkalizing power of pure lemon juice! Purslane is delicious in salads, soup, curry, stir fried with other greens, or blended in your favorite vegetable smoothie. The garden is about 3/4th of the way planted. It would have been completely planted and the irrigation system installed if it was not for Mother Nature! This winter we had little if any snow or rain! However, in May we have had almost constant rain! This has made it difficult to get everything completed when planned. On the bright side, we need this moisture desperately and it is worth the delay. I have planted all of my peppers which include, green, red and yellow Bell Peppers, Jalapenos, Hungarian Wax, Anaheim Peppers and Red Chile peppers. I planted Black Beauty Zucchini and Yellow Crookneck Squash. The tomatoes are about 3/4 of the way planted. They include Park Whoppers (picture below), Beefmaster, Moscow, Early Girl and two variety’s of cherry tomatoes. I am currently waiting for a break in the rain to plant a few heirloom variety’s. These will include, Russian Black Krim(picture below), Brandywine, and Zebra. 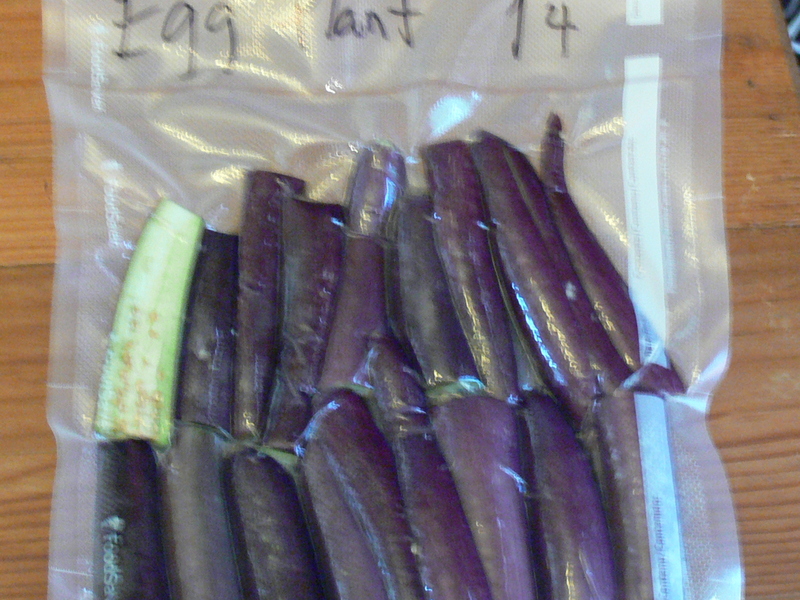 I also have planted Japanese Egg Plant and two kinds of slicing cucumbers. The herb garden consists of Sweet Italian Basil, Oregano, Thyme, Mint, Rosemary and Chives. I had installed about half of the drip irrigation system before the rains came. I will update this project when finished. I have two planting boxes that work great for kale, carrots, turnips and beets. I will be planting those this week as well. I decided against growing sweet corn and potatoes this year. We have a local farmer who has a farm stand with organically grown, delicious sweet corn, Red Pontiac and Yukon potatoes. Unfortunately, with the growth of our town this farmer may fade into the history books after this season. This is the second year of my experiment with a larger garden. Last year, I cleared bushes, trees, decorative curbing and grass from my side yard and transformed the 500 square feet of lush yard into a larger garden. 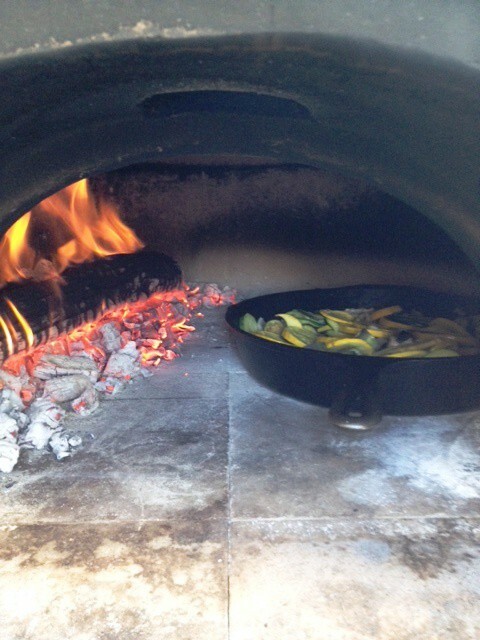 The garden is located just off my outdoor kitchen and is very convenient when cooking with the wood fired oven. If I had my way, I would turn all of the grass area in my backyard into a garden. However, my wife has nixed that idea as we would have no area for our dog Buddha Bear to play. • Aerates plant roots by loosening heavy clay soil. • Adds body to sandy soil. • Saves water by absorbing and holding moisture. • Reduces leaching or runoff of nutrients present in or added to the soil, releasing them over time. I will also be installing a new drip watering system to direct the flow of water directly to each plant. This will also reduce the time spent watering the garden by hand. I plan on covering the development of this drip system on the pages of this blog. I plan on putting the plants into the ground by mothers day. Mothers Day is traditionally the time in Northern Utah when the chances of a late spring frost are minimal. I will keep you updated on the progress of my garden throughout the growing season. Stay tuned! This recipe is perfect for a fall dinner. You can use either wild or domestic pork chops for this dish. 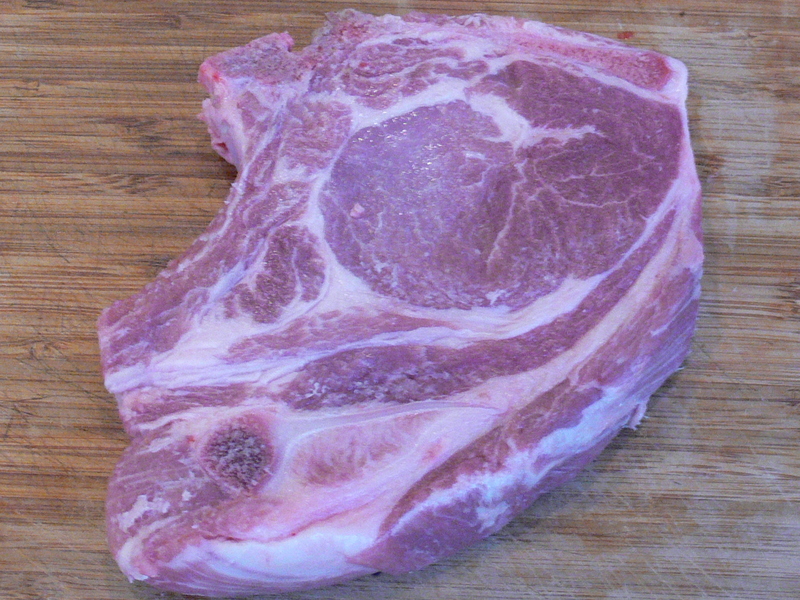 I prefer the rib chops as they tend to have more flavor, fat and porky goodness. I serve this chop over my homemade version of Ratatouille from the vegetables in my garden and then top it with a delicious mushroom cream sauce. 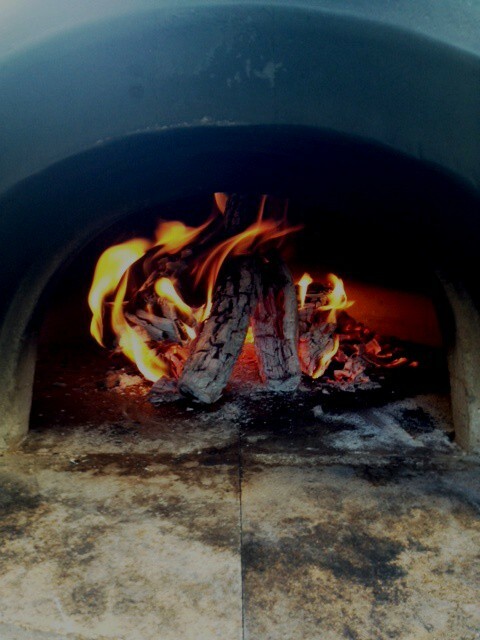 I made this recipe in my wood fired oven using apple wood. However, this recipe is just as good in a regular oven. 1. 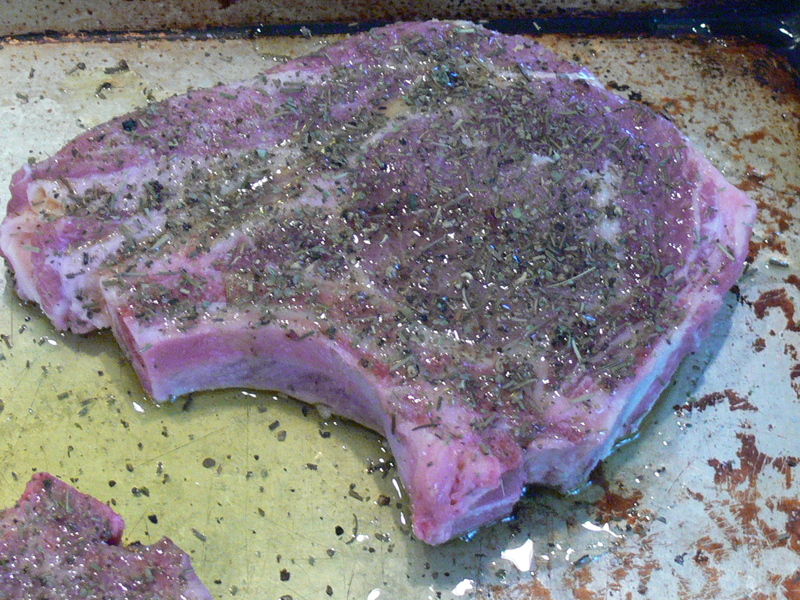 Rub the pork chops with olive oil and season with herbs, salt and pepper and let marinate in the fridge for 1-2 hours. 2. To prepare the Ratatouille, cut up the zucchinis, eggplant and crookneck squash into 1/4 inch round slices, chop the onion and garlic. 3. Put about 3 tbsp of olive oil into a heavy cast iron pan and heat. 4. When the oil is hot, add the garlic and onion to the pan and sweat. 5. Now, add the eggplant, zucchini and crookneck squash to the pan. Stir to combine all ingredients. 6. Season vegetables with salt and pepper. 7. Cook vegetables until soft. 8. To prepare the Mushroom cream sauce, place the mushrooms (dry) in a cast iron pan and cook until all the moisture has evaporated from the mushrooms. Season the mushrooms with salt and pepper and add 2 tablespoons of olive oil. Saute mushrooms until soft and cooked through. Add the wine to the mushrooms and cook until reduced by 1/2. Now, add the cream and reduce by about 1/3. Add butter and whisk into the sauce. Taste and season with salt and pepper accordingly. 9. To prepare the pork chops, spread the hot coals evenly on the floor of the oven, place a Tuscan grill over the coals. Place the pork chops on the grill and cook until done, the time will vary depending on the heat and quantity of the coals. 10. 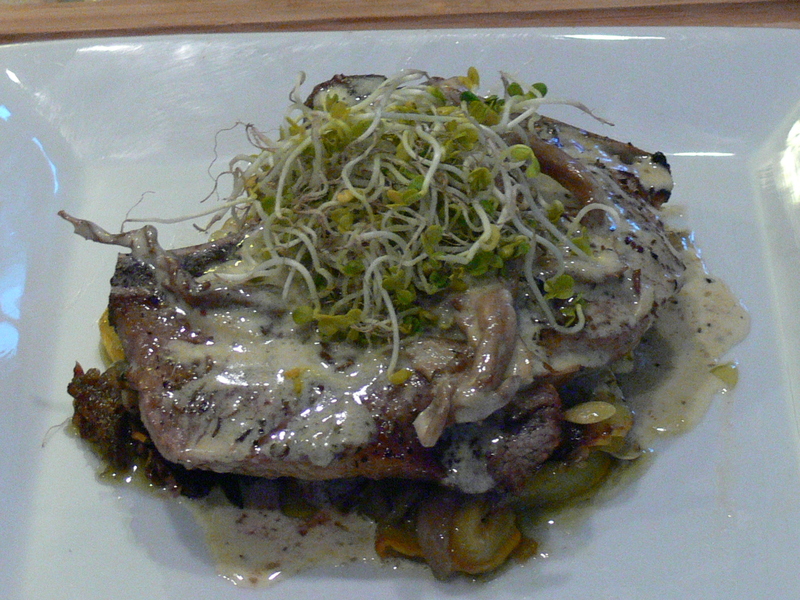 To serve, put the Ratatouille in the middle of a plate and place the pork chop on the Ratatouille and top with the mushroom cream sauce. Garnish with sprouts and serve. 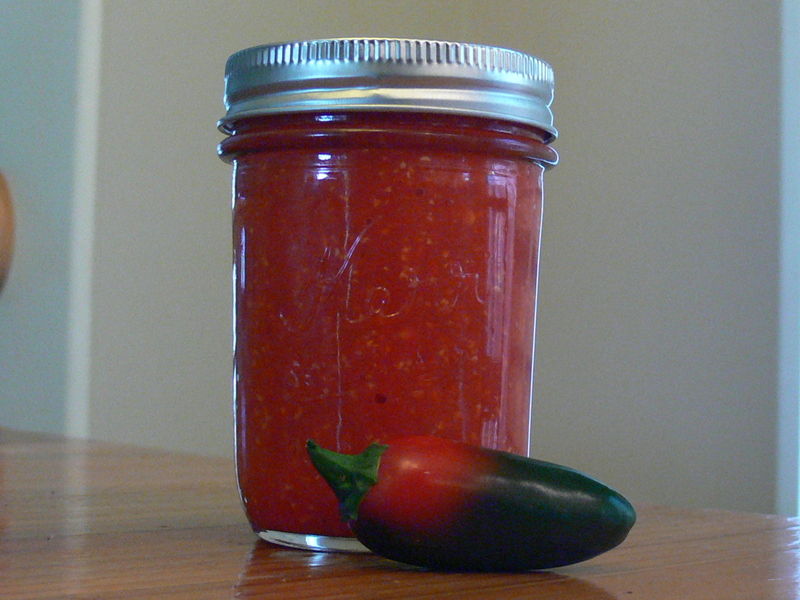 Today, I made homemade Sriracha hot sauce and used the Food Savor to vacuum pack Zucchini, Crookneck Squash, Green Beans and Japanese Eggplant from the garden. 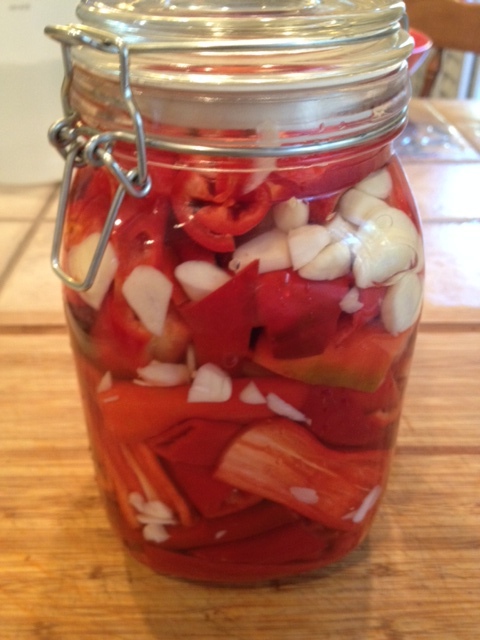 The garden is in full production mode and I now have enough extra vegetables to put the excess up for this winter. 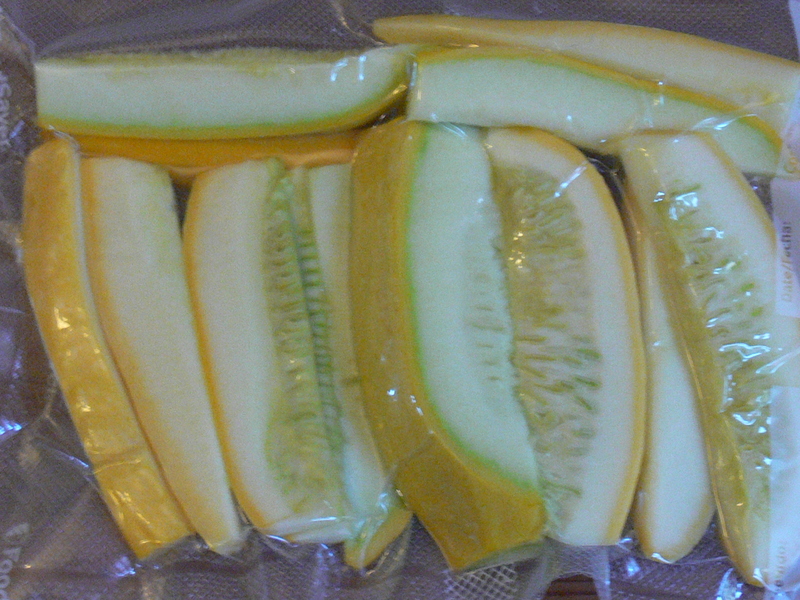 I prefer to freeze eggplant, zucchini and other squash because they get soft when you can them. 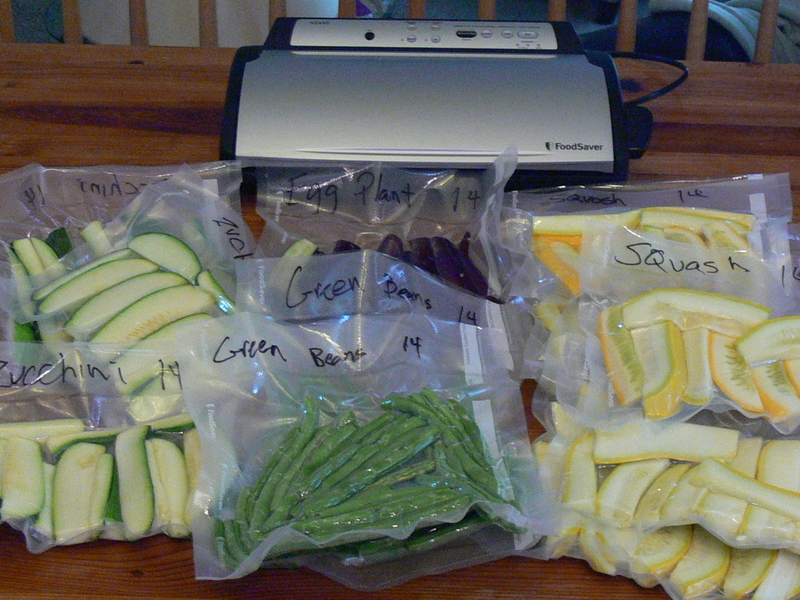 Vacuum packed vegetables – It will be really nice this winter to thaw these out and have a little taste of summer.